Photo by Flickr user istargazer. Dashboards have been used heavily in parts of the private sector for a long time, but they seem to be making inroads in the nonprofit and government worlds as well. The premise: just as with a car or airplane dashboard, a nonprofit staffer can quickly glance at the gauges and clearly understand the real-time status of key systems and indicators across the organization. The understanding won’t be deep – they may need to probe more thoroughly to fully understand anything they are seeing on the dashboard – but they can very quickly get a sense of how well the organization is functioning and if any problems are emerging. They are dynamic. They display information that is changing on a regular basis. They rely heavily on gauges or other data visualization displays to convey information in readily understandable formats. 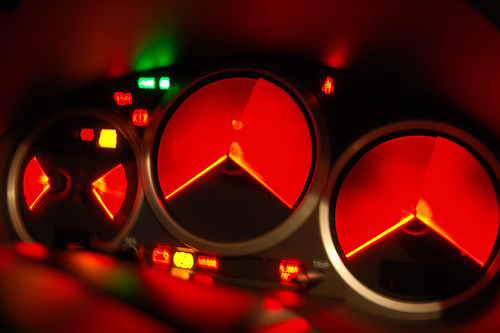 Even with these criteria, however, the dashboard concept is used to describe a diverse range of displays, each distinct in function and design from the next. As the dashboard concept takes great hold among nonprofits we are encountering some confusion among our clients about which is which and what people mean when they use the term. These display detailed information about a particular area of an organization’s operations. Many customer relationship management systems, for example, like Salesforce and Raiser’s Edge, include dashboards to make it easier for the development staff to track fundraising activities, donations, and other performance measures. Fundraising and advocacy management tools like Convio use dashboards to display campaign status. Google Analytics, with its robust dashboard system displaying key web site metrics, is another example. Technical dashboards help specialized staff keep a close watch on what’s happening within their organizational purview. Technical dashboards are typically inward facing, so that only staff and perhaps board members can view them, but they can be outward facing as well. The Indianapolis Museum of Art’s dashboard is an oft-cited example. Organizational status dashboards, like the one the software company Panic described on their blog, are another variant. In contrast to technical dashboards, which tend to focus on a single functional area within an organization, status dashboards display less information from a wider range of functional areas across an organization. A status dashboard is the answer to the question: what is the critical information everyone in the organization should be able to view all the time? Rather than probing deeply into any one area of an organization’s operations, they offer a broader overview of value to everyone. Increasingly, we are seeing dashboards used in external accountability contexts: a nonprofit or local government that wants to share its real-time performance data with its donors and its community. The Town of Oro Valley in Arizona maintains a financial dashboard displaying the town’s financial performance compared to past trends. It’s not a great example in that it is only updated monthly, and not in real-time, but it’s at least in the ballpark. Over at PlaceMatters (where I spend part of my week), we’ve been doing a lot of work on sustainability dashboards, web-based tools that openly share a community’s performance against its sustainability goals. Incidentally, we described the Indianapolis Museum of Art dashboard as a Technical Dashboard because of its depth, but it really serves as an Accountability Dashboard as well. These can be inward or outward facing, and typically show visualizations of unfolding data streams in real-time. These aren’t organizational in nature but, rather, are tracking events that are taking place outside the organization. The data stream may have implications for an organization, but it isn’t specific to that organization. Al Jazeera’s “Region in Turmoil” dashboard shows the volume of Twitter traffic by country in the Middle East as a proxy for the level of political activity. These are typically designed to compare likely outcomes of a range of future scenarios across a range of key metrics. For instance, MetroQuest uses dashboards to compare multiple regional development scenarios across factors. CommunityViz, a GIS-based data visualization and decision support tool, allows user to analyze the environmental and other community outcomes from a range of land use scenarios, and it uses dashboards to display those outcomes across a range of factors. We shouldn’t entirely neglect the category of “Displays That Are Called Dashboards But Aren’t.” It probably isn’t useful to use ‘dashboard’ to refer to web pages full of relatively static narrative information, for example. One example is the recycling portion of the Emory University Sustainability Dashboard. We would welcome your thoughts. Does this seem like the right breakdown? Are we missing anything? What are the terrific examples of each category? Strategic, where executive decision-makers review performance relative to longer-term strategies. This seems like a pretty useful scheme. You can also classify dashboards by scope (individual, department, enterprise), domain (sales, manufacturing), update frequency, type of data, and so on. I’m curious about how nonprofits are currently using dashboards, and which of the types I described in this blog post and which of the types you describe here they are actually employing. All of these seem like potentially useful taxonomies. At glow.mozilla.org, Mozilla maps downloads of Firefox 4 along with a nice presentation of tweets using the #fx4 hashtag. Thanks for asking fo my thoughts on this post. It’s an excellent breakdown of different types of dashboards, and into interesting categories. I’ve worked with several small non-profits on their organizational dashboards, which they tend to use as a internal tool to monitor staff, budget and board capacity and interest. Each measure has a goal, and is then rated as celebrate, monitor or act now. A red, or ‘act now’ score was almost always interpreted as an opportunity to either reframe the objectives of the project, indicate that the responsible staff had been over-assigned, or recognize that other projects needed to be de-prioritized. The initial fear with these types of dashboards is that the results will be used as performance reviews of the staff, making one essential role of a consultant when building dashboards, the training of the management on how to best interpret the results. Also, on a side note, your links should go to a new tab, so I can keep you examples open while I read the post so I can check back and forth to compare them! That’s helpful and interesting, Dana – thanks. We’ve been tinkering, building one, and I’d love to know more about what gauges you found most useful on those internal dashboards and how you assuaged those performance-review fears. Bright Ideas is a biweekly(ish) newsletter sharing ideas and updates on content strategy and storytelling for advocacy and social good. We're based in sunny (and sometimes snowy), Denver. Come visit.